Arielle is a Konawaena High School student. Shanai Ortiz, a Konawaena High School student is being awarded one of the scholarships for a High School Student attending the WH Community College at Palamanui. The scholarship will be awarded $500 for each of the first two semesters. The following students are being awarded a special one time (lump sum) scholarship as approved by the Board of Directors of the Rotary Club of Kona Community Foundation. At the meeting last week, the club presented Community Service Awards to four very special people. Gloria has been involved in the theater our own Aloha Theater, along with the original play festival. MARNI HERKES—Vocational Lifetime Community Service Marni has been a very active member of our community for many, many years. She always had the best interest of Kona and always gave her all. DELBERT SMITH— Vocations Services Employee of the year 2015. Delbert has been the “van driver extraordinaire” at the Regency at Hualalai. All of the residents and staff appreciate his dedication to his interaction with the residents. IRONMAN WORLD CHAMPIONSHIP—(Accepted by Diana Bertsch, VP) Employer of the Year 2015. The Ironman has become an integral part of the Kona Coast and has given back $1.2 million to the community. We were so very honored to have the opportunity to recognize these three individuals and a company, all who have given so very much back to their community. The detailed introduction for each of these special recipients is posted on our website on the “speakers” link. On Thursday, February 5, 2015, we will be meeting in Ballroom #1 instead of the Paddler's Restaurant. Rotary Club of Kona members and guests are working at the MEC Golf Tournamet, our annual fundraiser !!! I am happy to report Sunday's "Project Compassion" event benefiting Rotary’s "POLIO PLUS" was very successful. Total funds raised was $7,052.07; of which $370.12 was 20% of net sales, $408.76 was tips and remainder was mug sales, sponsorships and individual donations. The next event is scheduled for February 22nd for the benefit of "THE PREGNANCY CENTER". We'll look forward to seeing you all there! Mahalo to the many Volunteers, Rotarians & Denny's for all your support & hard work! On Thursday, September 11, 2014 the Rotary Club of Kona presented a $25,000 check to the Rotary Club of Kona Community Foundation. The funds will be added to the investment funds of the foundation with the interest and dividends used to fund our club's annual scholarships. Each year we present $14,000 in scholarships. In 2014 we added 8 additional scholarships. All scholarships are presented to students attending schools in West Hawaii who are continuing their education at the community college, college and university level. It appears that a number of Rotarians will not be able to attend the meeting today as they prepare for the approaching Hurricane / Storm Iselle. Thus, the Regular Meeting of the Rotary Club of Kona has been CANCELED. In addition, the Rotary Club of Kona Community Foundation Annual Meeting scheduled for 1:00 pm today, has also been CANCELED. 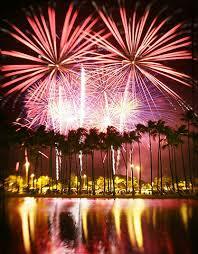 Be Safe and we'll see you all next Thursday, August 14, 2014. As I said at Saturday's fabulous Installation Dinner, we've had a good year of building up our club! We not only won the award for the largest percentage membership increase in the District, but we're bringing in two more new members this week! You've all helped to make this a great year, and I thank you for giving me the opportunity to serve again as your president. It seems to me that we've also built up our friendships and fellowship, while providing ever-increasing service to our community and the world. As I'm sure all of you know, almost all of the good things that we did this year depended heavily on the skills, energy and enthusiasm of Liz Heiman, our Vice President and now President for the 2014-15 Rotary year. I can't thank her enough for all she's done, and I feel that convincing her to take on this 3-year commitment (PE, Pres, PP) is an important part of what I've been able to do for our club as president. MAHALO Liz! As noted at Saturday's gala, all of the members of the Leadership Team made major contributions to the success of this year. I won't go through all the kudos and mahalo again here, but I especially want to thank Chrys Yamasaki for her continuing service as editor of the Coffee Blossom. She continues to maintain the high standards and helpful content that have made our newsletter one of the best around for many years. She was the Coffee Blossom editor when I was club president in 2001-02 and it was a great relief to me when she agreed to continue again this year. I've relied heavily on her organizational and publication skills both times - and she's similarly served several other club presidents in the intervening 12 years. MAHALO Chrys! Tom's always there helping, and generally too busy to take credit for all he does. Kimber jumps in to volunteer when things need doing and she's learning rapidly how to accomplish things in Rotary. James has thrown himself into every project and greatly improved all that we've done this year - and we're really pleased that he's agreed to be our VP-President Elect this next year. Mahalo to every one of you in the club for making this year so successful - and fun! Join us Thursday, May 8, 2014 for a BBQ lunch at the Old Airport Beach Park. Sunday, April 14, 2014, the Project Compassion event at Denny's will raise funds for Therapeutic Horsemanship of Kona. Please come, enjoy fellowship and support this great organization. The Rotary Club of Kona is offering up to eight (8) scholarships to students currently enrolled at Hawaii Community College - West Hawaii who have earned at least 24 credits and who are working toward an Associate Degree or Assoicate of Applied Science Degree. The scholarships are for $1,000 spread over two semesters. Application forms are available through the school counselor and on the club website at www.RotaryClubofKona.com (in the downloads column). Applications are due no later than March 30, 2014. The Rotary Club of Kona Community Foundation is accepting scholarship applications from West Hawaii public and private high school seniors for three scholarships. The $4,000 Jim and Sis Bedingfield Scholarship is paid out in four annual installments and the $8,000 Ken and Marge Clewett Scholarship is paid out in four annual installments. Eligible students for either scholarship are generally those who would have difficulty continuing their education without some type of financial assistance. Candidates are evaluated on five areas: scholastic and academic achievement; leadership, personal involvement on campus; community service and activities; extracurricular activities, employment experience; and financial need. The $1,000 Ron and Kathy Hawkes Vocational Scholarship is paid out in two annual installments. Students planning to attend a vocational/trade school are invited to apply for the scholarship. Applications for any of the above scholarships are available from any school guidance counselor or by contacting Peggy Peckham at 326-1101. The deadline for submitting applications is March 31, 2014. Yes, it is time to start gearing up for our 2014 Champion's Tour opener! Mahalo for your interest in volunteering for the Mitsubishi Electric Championship at Hualalai Resort. Each year over 400 caring individuals volunteer to support the tournament in a variety of positions - making it one of the best events all year for the professionals of the Champions Tour. 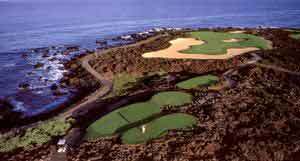 Over the past 16 years the PGA Champions Tour, The Four Season's Resort at Hualalai, and the Rotary Club of Kona Community Foundation have partnered in managing this tour opener for the Championship Tour. The end result allows for charity contributions to come back into the West Hawaii and Big Island Community These donations help with deserving improvement projects, scholarships, Eyesight testing in primary school grades, Junior Golf Programs and more! It is amazing to be a part of such a wonderful benefit for our community and residents and all this is not possible without you hard working, fun loving, dedicated Volunteers of Aloha! Thank you again for your interest. In order to participate, please look below and click on the Volunteer Registration tab. Complete the entire form as indicated and click where indicated to submit your registration. You will also be able to check our online Bulletin Board for information on golf privilege, Mahalo Party, uniforms, schedules and more! Please go to the Bulletin Board on the web site www.HualalaiVolunteers.org We have posted assignments under the "Volunteer Assignment Listings" topic (Here is a link http://hualalaivolunteers.org/bb/viewforum.php?f=17 ). You will need to go to the most recent posting and open the attached file for the Volunteer Alphabetical Listing with Assignments. Scroll through the report to find your name and listed assignments. More detailed information regarding assignments can then be found under each assignment group topic - such as "Golf Channel", "Marshals", or "Walking Scorers". Let us know if you have any questions or conflicts regarding your assignments. More emails will be coming soon detailing the dates and times for shirt sales, volunteer requirements, and golf privilege play. Assignments are still on-going, so continue to be patient if your requests have not yet been filled. We will be making updates to the Bulletin Board as changes and additions warrant it - which will be almost daily going forward. Thank you for your support and please call or email (Mgt@HualalaiVolunteers.org ) if you have any questions. Just a reminder that we'll be having our session, to continue and complete development of the three-year strategic plan for our club, on Saturday afternoon, November 16th. Liz Heiman has offered to host and lead this session at her home, and to follow it up with a potluck spaghetti dinner on Saturday, Nov. 16th. We'll run the planning session from 2:30-4:30 and plan to start eating, etc. about 5 pm. Liz will cook up some spaghetti, so we'll have a great meal if everyone brings something to drink, a salad, a dessert - or more spaghetti. This should be a good chance to get to know some of your fellow Rotarians in a more relaxed social setting than our formal meetings. Let us know if you need directions or transportation to Liz' home and we'll try to help. As noted before, Rotary provides a complete guide to this Strategic Planning process, so it'll be really helpful if you've looked through that before the event. The Guide (strategic_planning_guide_en.pdf) and our partly completed plan (Rotary Club of Kona Planning 2013-14.doc) are available in our club DropBox at Rotary/Planning/. Please contact me, Liz or Brian if you need help accessing the Dropbox. At Kealakehe High School we pride ourselves in building Relationships to foster Respect where all are Responsible to each other as we persist towards "Unity and Harmony Through Dynamic Education and Community for Everyone Every Time." Although we are the youngest high school in the district the WaveRider legacy is exemplary citizens who are high performing in all venues of life. In academics, athletics, the arts and as people the country is sprinkled with WaveRiders doing good things. Our logo, the WR wave breaking towards a starburst, was the design of one of our Physics teachers and serves as the inspiration to our students that they are riding the Wave towards a future yet to be discovered in the 21st. century. Like the ancestors of the host culture who navigated their path to Hawaii, we expect our students to use their knowledge and skills to navigate Hawaii to a better place in the future. Kealakehe High serves about 1600 students living in diverse communities spanning 50 miles in West Hawaii. We work to make education dynamic, relevant, rigorous and fun. As the largest public high school on the Big Island, we work hard to model how communities should be as we live, learn and play together. Thanks to all who helped make last week's meeting at the West Hawaii Civic Center work so well - and to those who helped with and participated in Sunday night's Project Compassion to support the Keiki Project of Hawaii Island United Way. This Thursday we'll be back at our regular venue at the Courtyard Marriott King Kamehameha's Kona Beach Hotel (that's sure a mouthful!!). The meeting will be a Club Assembly devoted to strategic planning for the rest of this Rotary Year, and Liz Zagorodney has agreed to repeat her great job of conducting the session. Please come, enjoy fellowship and lunch, and help us plan our upcoming activities. We need to have all of the service chairs at least represented - and it'll be a great opportunity for new members to get an overall picture of what's happening. Dave Buehler has offered to provide Box lunches from Buns in the Sun, but he needs to know your order particulars. The lunch options are: sandwich (turkey, ham, roast beef, tuna salad or veggie), chips, cookie and fruit or a salad (chicken Caesar, oriental chicken or chef). The program will be talks from some of our new members about their vocations/avocations, coordinated by our Vocational Service Chair, Jim Lightner. If you'd like to participate in the program, please contact Jim at 325-0911. 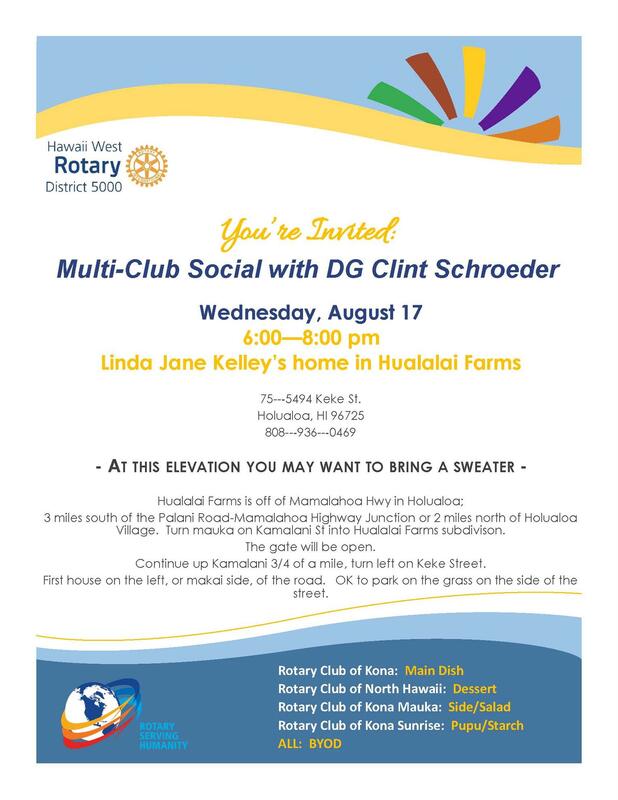 Join us this week and meet four of our Rotary Club of Kona Rotarians. We will hear from Gretchen Watson-Kabei, Kris Hazard, Scott Unger and Alan Clark . They’ll each have about 5 minutes to tell us about themselves and how Rotary has impacted their lives. Cheryl and Todd Holdcroft will soon be on their way to Japan for a 2-year adventure. Scott Unger is hosting a going away party for them on August 10, starting at 5:00 PM. Please bring wine or other beverage to share. 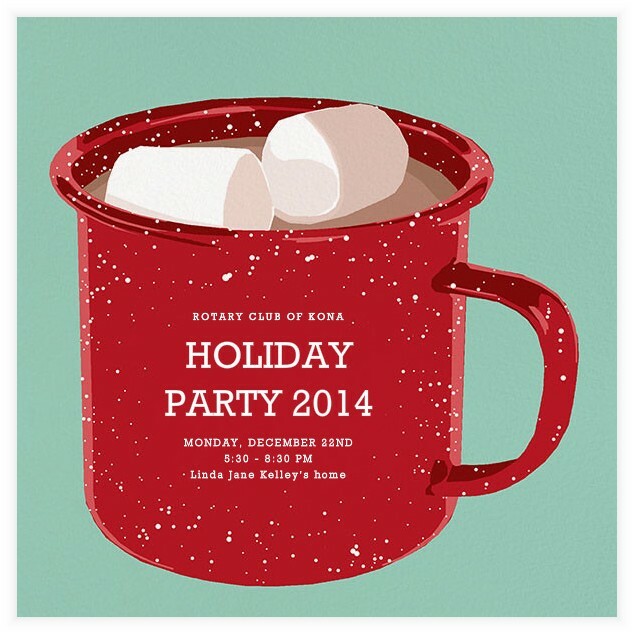 We will pass the coffee pot at Rotary next Thursday to help pay for the party. This week's meeting we will be mapping out our club's Rotary Year. All Club members are encouraged to attend and help the leadership team and President Tom set the foundation for the months to come. Our year has begun! I hope you’re all as excited as I am as we head into this new adventure. RI President Ron Burton’s theme is Engage Rotary Change Lives and I know that District 5000 Rotarians are set to do just that. This year we will be emphasizing the WHY in Rotary: Why are we Rotarians, Why do believe in Service Above Self? We’re also emphasizing the FUN in Rotary. I’ve asked each club to begin a new fun tradition that will engage and excite their members. I’ve also asked each club to start a new project that takes service in a new direction. This is also the year when we stay Forever Young: Young in ideas, Young in spirit, Young in projects and Young in membership. We are continuing our successful Ignite membership program and are aiming for a 20% increase by June 2014. Recruiting is important but so is retention. Let’s be sure that every member is engaged and excited about Rotary and working to make this the best year ever for the club. The Rotary Foundation begins a new era this month with emphasis on larger, sustainable projects with a more lasting impact. Forty-six of the forty-nine District 5000 clubs have qualified to receive funds and are in the process of deciding how to spend their allocations. Given the larger size of matching grants ($15,000 minimum) most clubs will need to cooperate to be able to participate. The District has identified three projects that clubs might wish to support to make it easier. There are also increased tracking, reporting and document storage requirements for both the clubs and the District. But the mission of the Foundation remains the same: To do good in our local communities and around the world. Rotarians and guests are invited meet the visiting Group Study Exchange Group from Poland and enjoy their presentation. We are their 1st stop in the state, so let’s show them our Big Island hospitality! Bring a pupu or salad. Main dish, desserts and beverages provided. October 26th we will be assembling furniture and hanging pictures for the kids rooms at the Mamac home that we sponsored in the Habitat Blitz Build. There will be a Halloween pot luck at 5:30 when the kids get to see thei finished rooms. All are invited. Please bring a heavy pupu. Drinks will be provided. November 4th is our Polia Plus Project Compassion. Please contact our new Rotarian, Lori, is you can help out or get a sponsor. December 15th is our Food Basket tri-club Community Service Project. We will need volunteers to collect food for 4 hours at a local supermarket, volunteers with trucks to transport the food to the Food Basket and volunteers to help with the parade. Also in November, dates and times to be determined, we will be doing our Keiki Vision project. The club and the community thank you for your support. Kona Alano Club. Project compassion is a join effort between Denny's, Rotary Club of Kona and the individual non-profit organization. Denny's will contribute a portion of each check, plus all of the tips. Please join us. It's not too late to sign up to work on the 5 houses. The Volunteer forms are available on the Rotary Club of Kona Website (left side as a download). No need to login...anyone can download the form. Email or fax the completed form as noted on the bottom of the form. We are dark so that Rotarians can attend the installation dinner at the Kona Vistas Restaurant at Kona Country Club. The dinner is from 6-9 pm and includes a prime rib buffet and music by Luna Gitana. Cost is $45 per person, and includes two drink tickets. See you there! Call Connie at 895-9538 to reserve your place. Ed Case, Senatorial Candidate will explain his position on the issues at our weekly meeting. Don't miss this chance to get up close and personal with the canidate! 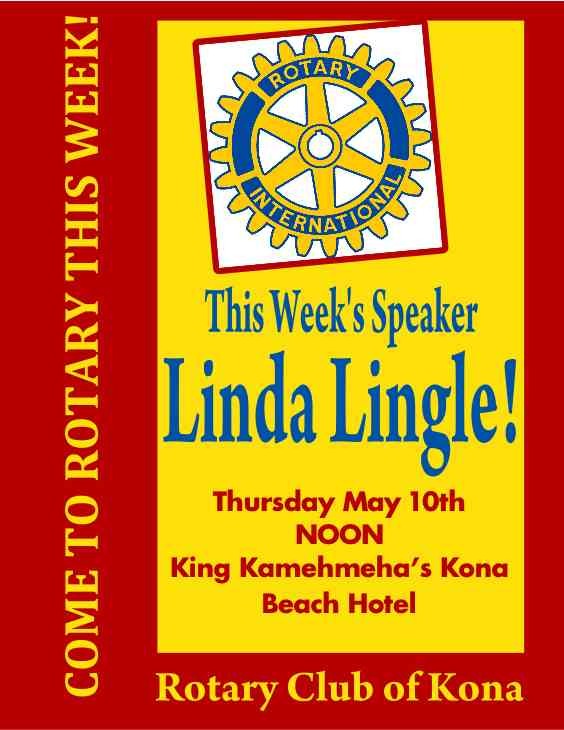 Our meeting is held at noon at the King Kamehameha Beach Hotel. All are welcome. Non-Rotarians please call 895-9538 to RSVP. During the Week of January 16th to January 22nd the Rotary Club of Kona manages over 400 volunteers for the Mitsubishi Electric Championship Golf Tournament at Hualalai. 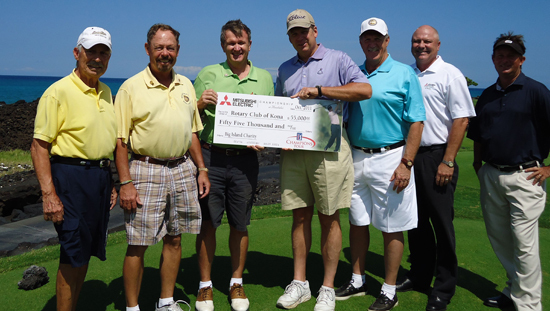 Since the Hawaii inception of the Mitsubishi Electric Championship at Hualalai in 1997, the tournament has made a significant economic and charitable impact on Hawaii's Big Island community. Since the tournament's inception nearly $650,000 has been donated to various island charities, including the Rotary Club of Kona, Kealakehe High School and Big Island Junior Golf programs. Charitable donations from the tournament have helped support the complete turf renovation of the Kona Soccer fields and public park facilities in Kailua-Kona, fund the ESP Dance Club for girls, acquire state-of-the-art equipment for the local Kona hospital to diagnose and detect kidney stones and beautify the Kona Old Airport COmmunity Park and Walking/Jogging Paths. The Rotary Club of Kona Community Foundation also provides scholarship support to selected High School Seniors each year. Keiki Vision Kealakehe: Seeing Results! Army 1-21 "Gimlets" LTC Robert Molinari and his wife Mrs. Mindy Molinari visited Rotary Club of Kona at the July 21st weekly meeting. LTC Molinari, the commander of the 1-21, presented the club with an honorary "Gimlet" board "IN GRATEFUL APPRECIATION OF THE KONA ROTARY CLUB'S PATRIOTIC SUPPORT OF THE 1ST BATTALION, 21ST INFANTRY (GIMLETS) DURING THEIR JUNE 2010- JUNE 2011 DEPLOYMENT TO IRAQ IN SUPPORT OF OPERATION NEW DAWN. MAHALO!" 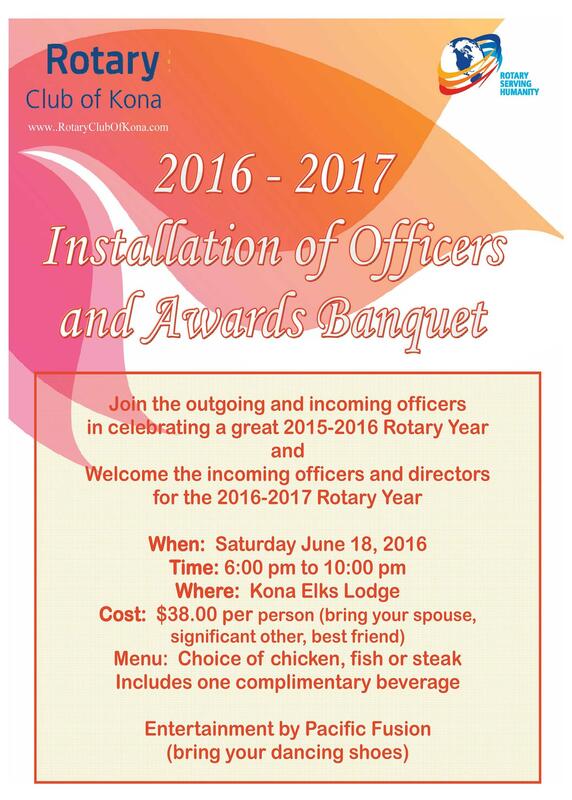 The club will be dark Thursday June 16th so that all can attend the Installation Dinner Party on Saturday June 18th. 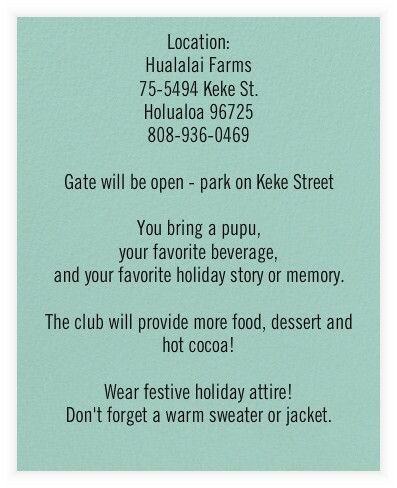 It will be held at 6 pm at the Keauhou Beach Resort. Cost is $45 per person. See you there! Rotary Works T-Shirts and Tank Tops Available! Mrs. Miki Konno presented the club with $1000 in memory of her husband Allen at the June 12th meeting. Allen passed away earlier this year at the age of 87, after 44 years of perfect attendance in Rotary. We are so close to eradicating polio. As Rotarians, this is the battle we have chosen to fight. For some of us that means going to Pakistan or Nigeria and giving vaccines to children. For most of us, however, it means contributing to the fight through donations. This year, all four West Hawaii Clubs have agreed to join forces and raise money to fight Polio on November 9th through the Project Compassion Polio Plus Fund Raiser at Denny’s in Kona. Come eat dinner and bring a friend (or 2 or 3). The Polio Plus Project Compassion is a great social event, and fund raiser that costs us nothing. 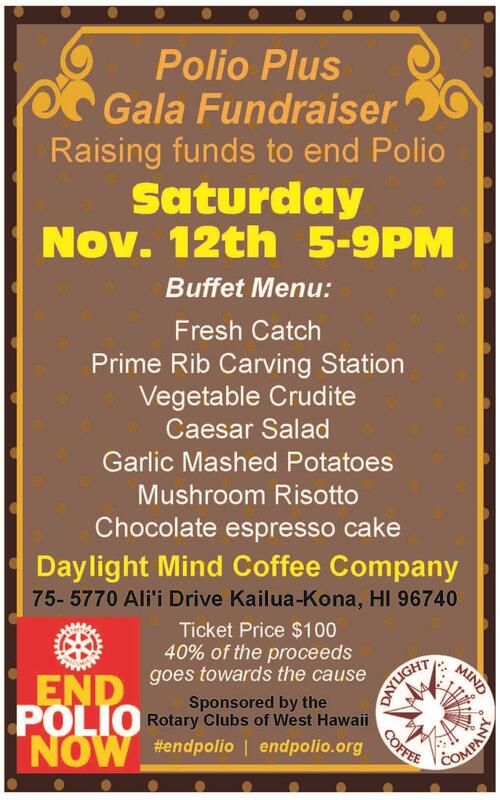 Please don’t miss this opportunity to join forces with the rest of the West Hawaii Clubs and Rotary Clubs across the world raising money to fight polio. IMPORTANT DATE: If you can find a $250 sponsor, to commit before October 28, 2014 will have the opportunity to receive recognition on our signs and fliers for the event, as well as post-event reports. Everyone can make a big difference. Thank you for acting quickly to gain support to eradicate polio worldwide. 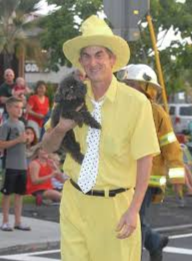 Kailua-Kona's Community Christmas Parade is Saturday, December 14, starting at 5:00 p.m., with primary sponsors the Rotary Clubs of Kona, Kona Mauka, and Kona Sunrise. It will begin at Kona's Kekuaokalani Gym next to Kona Pool, go south on Kuakini, down Palani, and along Ali'i Drive to Walua Road, just past Coconut Grove Marketplace. 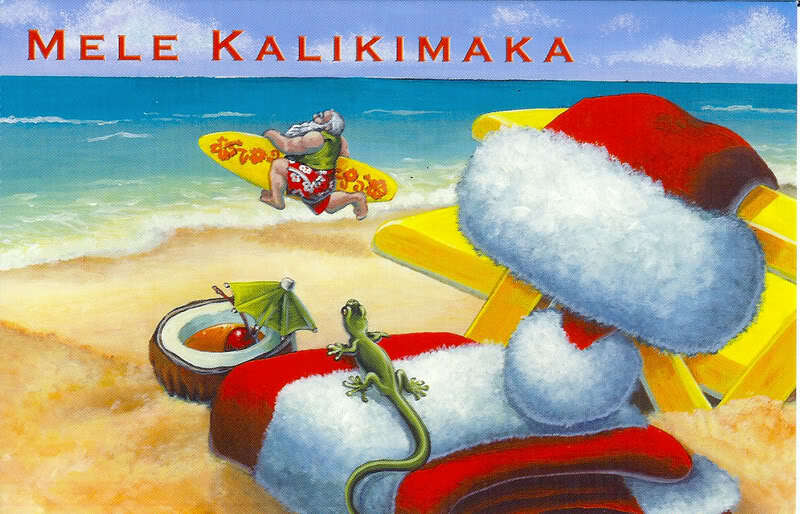 The parade theme this year is “Kona Kine Christmas!”. 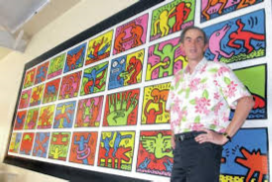 Jerry Tracy, Artistic Director of the Aloha Performing Arts Company will be the parade’s Grand Marshal. There will be approximately 70 entries in the parade, including community and corporate groups. 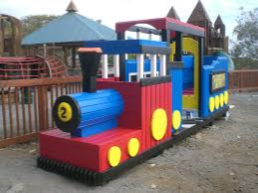 They’ll be numerous musical entries, and more than half of the entries will beautifully light up the evening, including HELCO’s Toy’s For Tots Train, and of course, Santa and his reindeer. 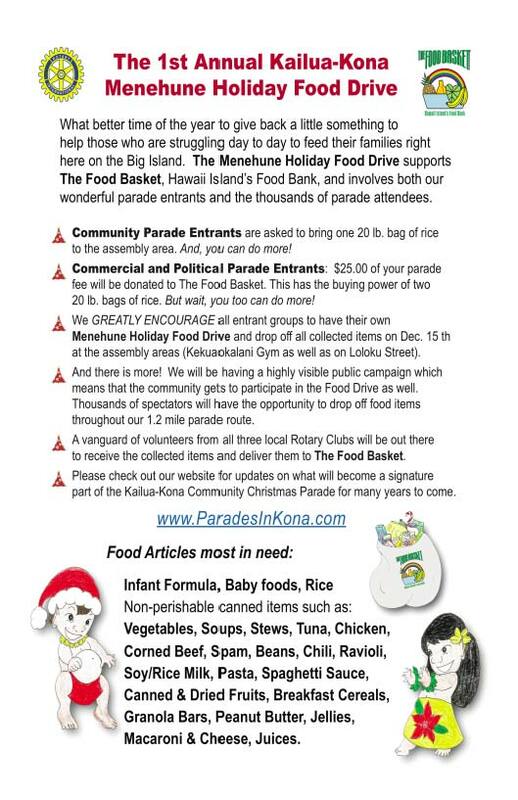 The Kailua-Kona Community Christmas Parade will once again be supportive of Hawaii Island’s Food Basket, and parade entrants and parade attendees are encouraged to contribute what they can. What better time of the year to give back a little something to help those who are struggling day to day to feed their families here on the Big Island. We have an unusual opportunity this week to sample the fine food and learn about the background of the exciting new “Three Fat Pigs” at Waikoloa King’s Shops. “ The Three Fat Pigs is a Restaurant and Gastropub by Big Island native and “Food Network Star,” Chef Ippy Aiona. Pairing the freshest island ingredients with modern techniques, Chef Ippy is a young, innovative chef who is not afraid to combine flavors and textures that will offer you a delightfully unique gastronomic experience. Enjoy lakeside or indoor seating and a creative, whimsical menu that changes with the four seasons. Looking for more fun and libations? Join us upstairs at “The Thirsty Wolf Lounge,” a full-service bar that offers craft beers, signature cocktails, pub snacks and a charcuterie bar. The Three Fat Pigs is “THE” place to be on Hawai`i Island. We’ll have a great meal, and Chef Ippy himself will talk to us about his and the restaurant’s history, status and plans. OR—BLT sandwich with pickled cherry tomatoes and homemade house BBQ Chips. Rotary of Kona Community Foundation Scholarship Applications now Available. Deadline March 30th. Rotary Club of Kona announces scholarship deadlines for 2012 applicants. Sis and Jim Beddingfield $4000. $1000 each over four years. Ken and Marge Clewett $8000. $2000 each over four years. Ron and Kathy Hawkes Vocational Schoalarship. $1000. $500 over two years. Applications are due March 30th. download the forms from the link to the left "download files". Seventeen Years and Counting! That is how long our club has been organizing the Champion Tour’s event at Hualalai. It started with an idea and a yellow legal pad. It took many hours and lots of dedication to pull off the first event under heavy micro-managing. Today it has evolved into what appears to be a very seamless operation that works like a clock. As most of us know, it’s not that easy. We just make it look like it. Many, Many, Many hours of preparation and hard work go into making this event the success that it is. It starts a good six months before the gates open. When you see our Co-Chairs, Kris Hazard or Larry Webb, make sure you give them a big Mahalo for all the long hours they put into making this year’s tournament so successful. Many, many thanks also go out to all the management team who put so many hours in before, throughout, and after the tournament. Thanks to all the Volunteers. It is a pleasure working with all of you. I hope you are all doing well as we head into the holiday season. I wanted to share the attached certificate with you. At the Zone Institute in Squaw Creek on November 9-11, our District was recognized as the #2 District in Zone 26 for per capita giving. 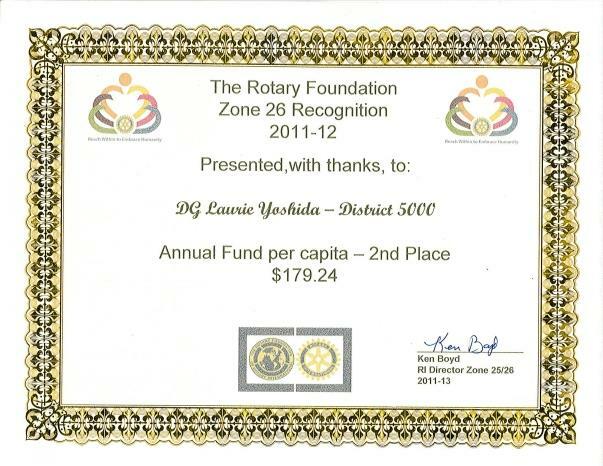 That is quite an accomplishment as Zones 25 & 26 are among the top Zones in the Rotary world when it comes to giving to The Rotary Foundation. Congratulations to all of you. Thank you for your hard work and commitment to Rotary. Project Compassion - Polio Plus This Weekend! Have a meal, or even just a dessert, and 20% of the food and drink amount will go to Polio Plus. 100% of any tips you leave go to Polio Plus. 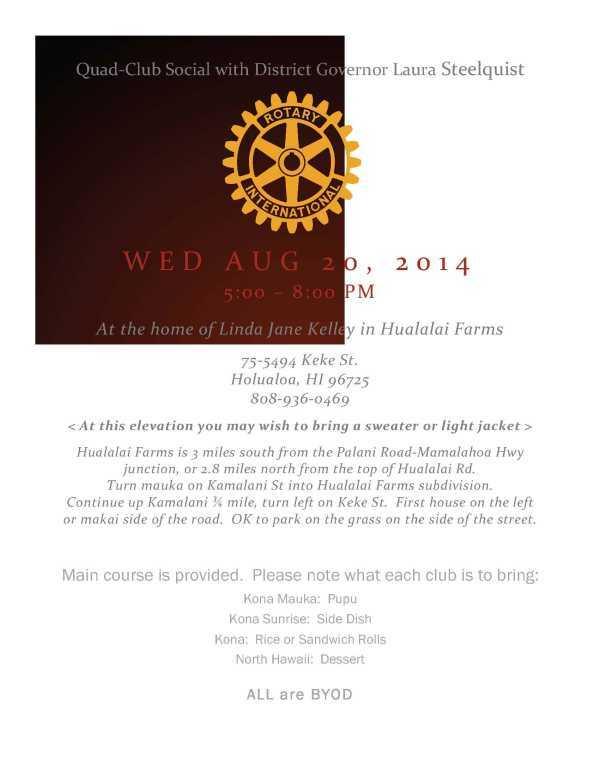 Your fellow West Hawaii Rotarians will be there eating and serving food. Bring a friend, have a meal and help Rotary in its final push to eradicate Polio. Tom Whittemore, chair of the Blitz Build, told me at the blessing today how much he enjoyed working with the Rotarians. He was impressed with the spirit of Rotary in all of the Rotarians who were there. This is a proud moment for Rotary, Habitat for Humanity, the families and the whole Kona Community. Terrie wanted us to know just how much it means to her. You are all invited to come and meet Terrie Mamac and her family for whom we will be building the Rotary House with Habitat for Humanity. We are truly looking forward to making this dream come true for Terrie, her 5 year old daughter Layla and her 9 year old son Hailama . 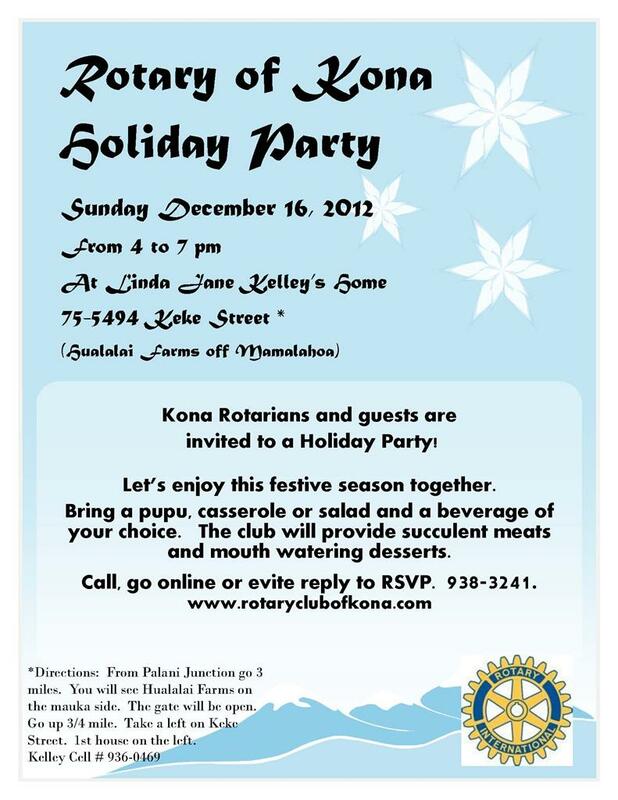 Please come and enjoy our Rotary O’hana with this deserving young family. 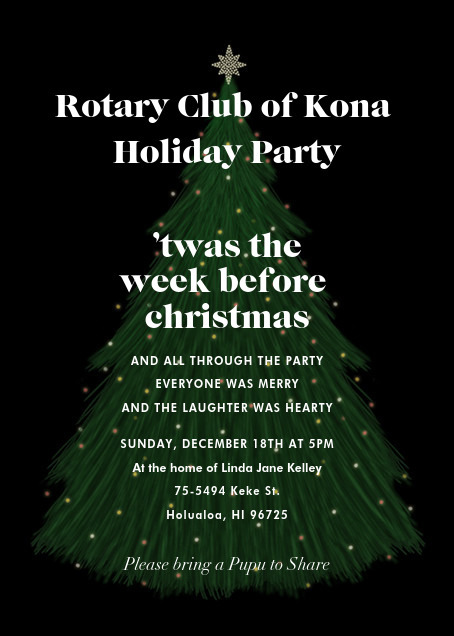 Kona Rotarian Connie Dizinno has graciously offered to have this event at her home. Where: 73-4445 Holo Holo Street, Kailua Kona in the Palisades area. Date & Time: Saturday September 1st, 5:00 p.m. until………. Please bring a dish to share and BYOB and bring your swim suit. 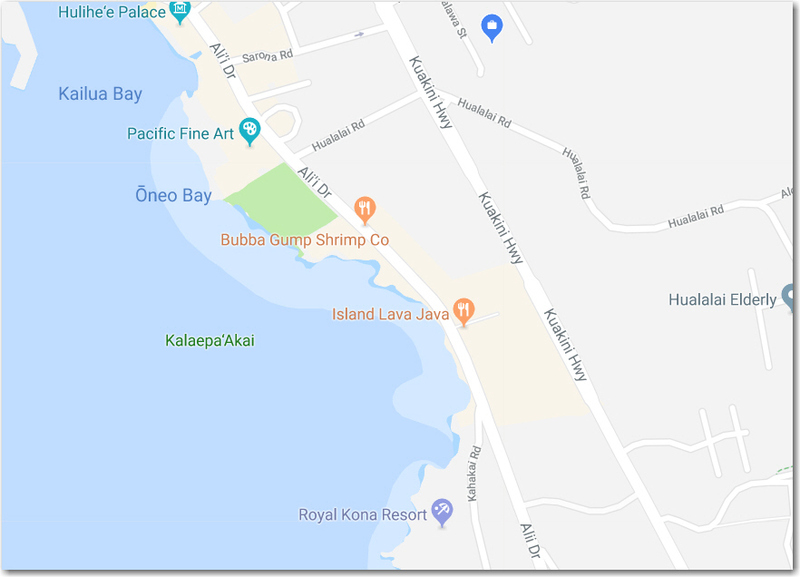 From the Kailua Kona Post Office in Lanihau Shopping Center Drive to Queen K Highway and Turn left onto Queen Kaahumanu Hwy, Continue to follow Queen Kaahumanu Hwy, Turn right onto Kaiminani Dr, Turn right onto Holoholo St, Destination will be on the left. Join us from 4-9pm at the Kona Denny's as we help Habitat for Humanity West Hawaii build a home. Five homes will be built in ten days in September; the Rotary Clubs of West Hawaii are joining together to sponsor one of these home. Stop by a a meal and meet some of our "celebrity" guest servers, including Mayor Kenoi, Dru Kanuha, Bucky Leslie, Dave Bateman, Fail Dawrs and many Rotarians. It promises to be a great night, one that will help us reach our goal of builiding a home for a deserving family in our community. The Rotary Club of Kona is a sponsor for three candidate forums. 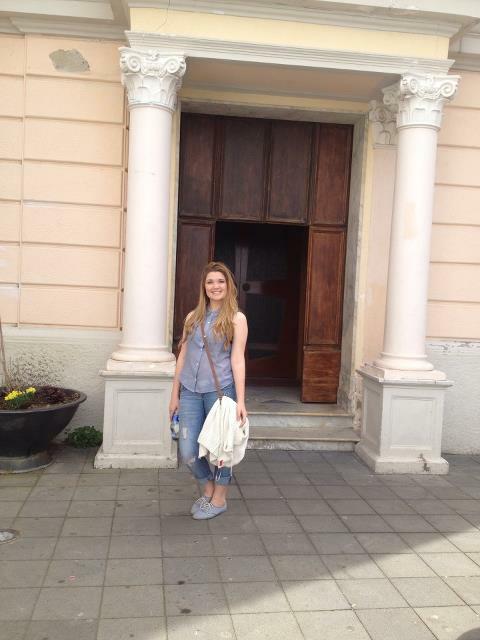 The first one was held on July 9 and had mayoral and public prosecutor candidates. The second will be held on July 16 at 5:30 PM and will have the U.S. Senate and House candidates. The last forum will be on July 23 at 6 PM and will have the candidates for the District 6, 7 & 8 County Council seats. All the forums are at the Kealakehe High School cafeteria. Here is a picture from the July 9 forum. Notice the Rotary banner on the stage! Plan on joining our Kealakehe Interact Club in the clean-up of the Kealakehe Parkway on March 1, 2012 at 3:30 pm. Bring your own gloves, hat and sunscreen. Let's all join our award winning Interact Club in this fun project. See you there! Grahamstown Video - Your Rotary Contributions at Work! Rotary Club of Kona will be dark on October 6, 2011 for Ironman Week. 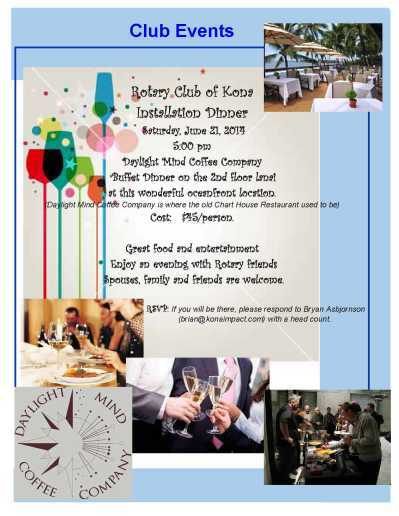 Rotary Club of Kona will be dark on September 8th, 2011. Hope to see you at the District 5000 Conference on Kauai.